Description: Priscilla Gilman experienced childhood as a whirlwind of imagination and creative play. Later, as a student and a scholar of Wordsworth, she embraced the poet's romantic view of children—and eagerly anticipated her own son's birth, certain that he, too, would come “trailing clouds of glory.” Though extraordinary, Benjamin showed signs of a developmental dis-order that would require intensive therapies and special school-ing, altering the course Priscilla had imagined for her family. 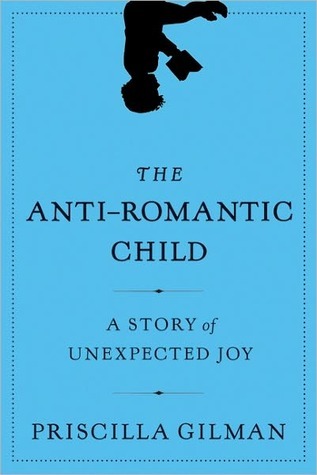 In The Anti-Romantic Child, an incredible synthesis of memoir and literature, Gilman explores the complexity of our hopes for our families and ourselves. Using Wordsworth's poetry as a touchstone, she describes her journey through crisis to a place of peace and resilience. Gilman illuminates the flourishing of life that occurs when we embrace the unexpected, and shows how events and situations often perceived as setbacks can actually enrich us. Beautifully writes about raising a child that has special needs and so wonderfully explains the need to let go of the dream of your child and love the child you have. "Anytime you get frustrated or irritated with him, try to remember how far he's come rather than how far you still want or need him to go. It helps. It helped us." "That literature has the power to comfort and sustain might seem obvious, but as a professional scholar of literature, I had been made to feel that literature was there to be analyzed, debated or worked on, not to be turned to for consolation, solace or inspiration." "My goal as a mother is to never stop fighting that battle for Benji's essential self and to teach him how to fight it on his own behalf." I agree with both of your "good stuff" and "not so good stuff" ~ She is a wonderful author and mother. However, when you stated "I was having a tough time reading this and couldn't put my finger on why", I do not believe it is a question of you denying or avoiding any issues. I, too, am a mother of an Autistic/non-verbal young man. When I began to read the book, I got to page 7 and thought to myself "this isn't the real world", at least where most parents of autistic, disabled children come from. Most of us were not surrounded by literature, wealth, etc., and I believe right there is where we begin to have a hard time relating to the book. Most of us do not have memories of vacationing in summer cottages and trips to Spain. Instead of literature and poetry coming to our minds, we tend to think thing such as "okay, it is 2 a.m., I am wiping the walls where my autistic son decided to "play" with his "body functions", I am crying in the bucket of water, school districts are not being helpful, finances are being stretched to their breaking point, etc..." So, I do not believe you are denying anything regarding your emotions. It is a beautifully written book. It just does not "cater" to most regular people in the world. Once again, my opinion as well.